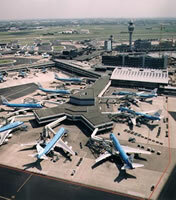 The name of the airport, Schiphol, was derived from a former fortification called Fort Schiphol which was part of the Stelling van Amsterdam defense works. Before 1852 there was a large lake at the Haarlemmermeer polder where the airport now lies. The shallow waters of the lake would often experience sudden violent storms which claimed many ships. Indeed this was the reason why the lake was reclaimed. Schiphol translates to â€˜Ship graveâ€™ in English, referring to the many ships that were lost in the area. Amsterdam Airport has regularly appeared in Europeâ€™s top five airports list in terms of traffic and number of flights as the airport serves almost 50 million passengers per year. There are many intercontinental airlines that operate from this airport. The airport also ranks as the 6th largest in terms of international traffic.